Welcome to Illusions Glass Designs, the place to find unique, one-of-kind contemporary Dichroic glass jewelry and home furnishings. 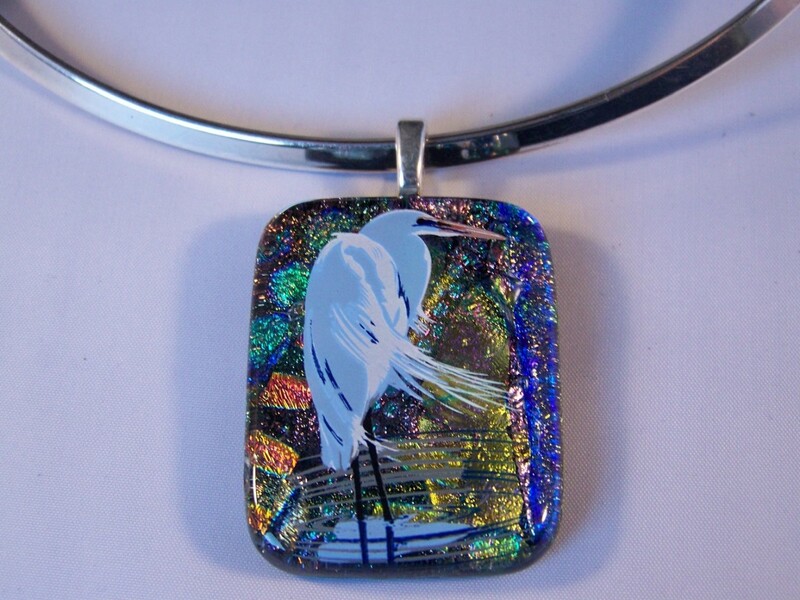 Our jewelry line features Dichroic glass pendants, earrings, bracelets, and rings. Each piece of glass is a miniature work of art, handcrafted one at a time with care in my studio located in suburban Minneapolis, MN. 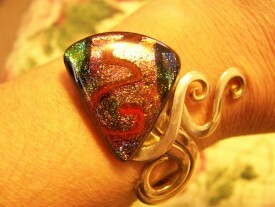 Many of my items are set in silver-plated settings or .925 sterling silver. In addition to the jewelry line, we also create customized wall tile. We work closely with the customer to create the colors, sizes, and designs to give their home unique beauty for many years to come. Along with the tile, we can also create matching drawer pulls, cabinet knobs, and lighting fixtures. Dichroic glass is one of the most amazing materials being used by glass artists today. It was first developed for the space industry in the early 1960’s. Today, it is specially created by only a small number of glass manufacturers for use by artists and other specialties. 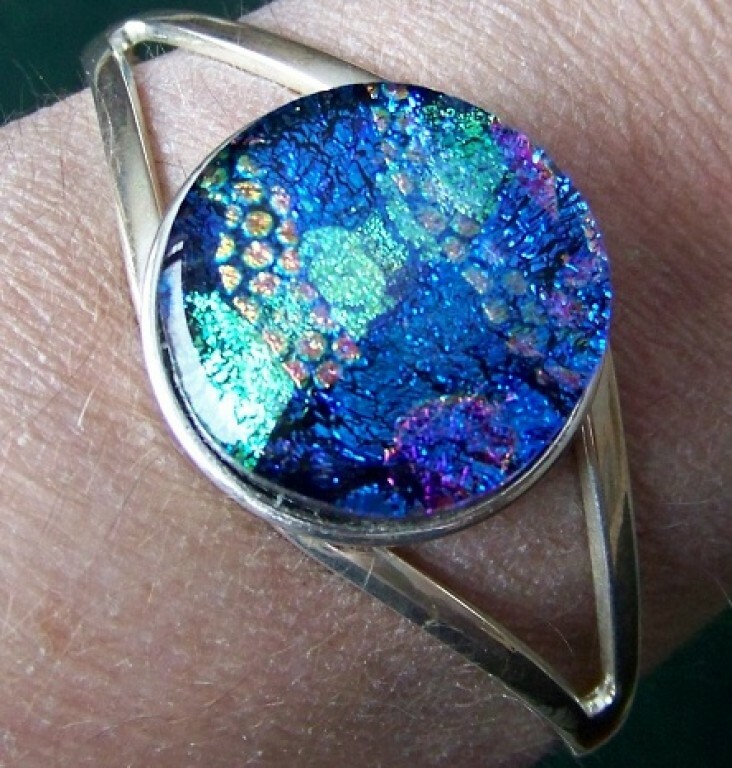 “Dichroic” is defined in the dictionary as, “The property of a surface to reflect light of one color and transmit light of another color.” Di- is Greek for two and -chroic is Greek for color, thus when combined we have Dichroic or two colors. Transmitted color is what you see when you look through a clear piece of Dichroic glass. Reflected color is the color you see when you hold the same glass in front of you and view it from different angles. In the manufacturing process, quartz crystal and metallic oxides are vaporized with an electron beam in an airless vacuum chamber and the vapor then floats upward and condenses on the surface of the glass in the form of a crystalline structure. Dichroic glass sheets may have as many as thirty layers of these materials, yet the thickness of the total coating is only about 35 millionths of an inch. 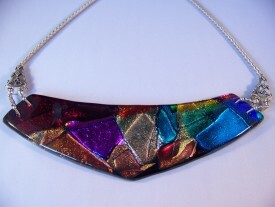 Dichroic glass comes with either a black base or a clear base. It comes in a variety of colors and patterns that can be combined to create unusual, colorful, and incredibly beautiful jewelry, tile, and decorative items for your home. A gift of Dichroic glass will forever be treasured as that one-of-a-kind creation that no one else will ever be able to duplicate. I grew up on the family farm in Iowa, the third of four children. In the early years, we didn’t have many luxuries in life like running water, a bathroom, or a furnace. As unusual as it is today, I went to the same school from K thru 12. I primarily studied business and went on to work in Human Resources where I spent most of my career until the mid 1990’s. However, life is always full of the unexpected. Somehow, the best laid plans don’t work out the way we think they should. In the mid 1990’s, I was diagnosed with a serious health issue that caused me to be disabled from my career in Human Resources. I spent much of the next ten years battling a recurring bone tumor and living in excruciating pain following multiple surgeries and a later diagnosis of severe rheumatoid arthritis. My health had derailed me from the track I had been on. I found that living life in pain was really not a life at all. My doctors suggested that I find a passion, something creative to do to help stimulate my mind, something that might take my focus off the chronic pain. I picked up some beads one day, glass beads to be exact. I was hypnotized by the iridescent colors, the shapes, the play of colors. I started doing some beading, creating designs in my head that my hands then turned into reality. 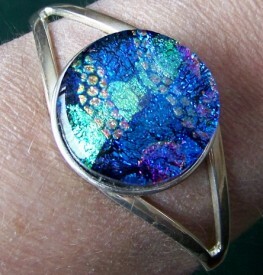 I developed a keen interest in particular for Dichroic glass, but it was elusively expensive for my budget. Time passed, and I bought a kiln and borrowed some books from the library to learn the process. My first pieces were creative, but not very sales-worthy, to say the least. But my passion continued and I taught myself how to make some glass that really was stunning. In the past few years, I have taken a few classes from a world-renowned instructor. That is what really helped my reach the next level of glass making. The world of glass opened my life to many new friends. It’s extremely flattering when a person touches or looks at my work and smiles, or tells me how beautiful my work is. Their kind expression tells me that others are touched, whether for a moment or for a lifetime, by the same beauty I found in glass. The optics of glass can bring the “illusion” of movement and life to any design, hence the name Illusions Glass Designs. Thank you for your time and I hope that my glass brings some unexpected joy to your life. Jun 20-22 MN STREET ROD ASSOC. For many years now, Illusions Glass Designs has been creating one-of-a-kind fork bracelets, using an antique silver-plated fork. Using an extensive process, we manipulate the tines of the fork by bending and stretching them in to a creative design. Then the handle is bent to create an adjustable bracelet. The piece is then adorned with one of our glass pieces to complement the tine design. These are truly one of the most beautiful of our original creations. Many different sizes, shapes, and patterns of compatible Dichroic glass are cut and stacked into unique designs and then fired in the kiln. A maximum of three layers can be fused on this first firing. After that, only one layer can be added before firing again. Our pieces generally incorporate 5-8 layers of glass. Finally, once we are satisfied with the piece we have created, we add a layer of clear glass to the top of the design. During the fusing process, the glass melts together and takes on a whole new character as the colors and patterns blend together into a one-of-a-kind creation. After the fusing process is completed, the piece is cold worked and shaped with saws and grinders. The piece is then fire-polished in the kiln. If desired, a multi-layer enamel decal can be applied to the top of the piece and then fired to become a permanent layer within the design. Receive a free snake chain when you purchase any piece of jewelry from www.illusionsglassdesigns.com.